Give me the name of a man who doesn’t look good in suits! The epitome of sophistication and class, suits mark the best of men’s fashion any day, cutting across cultures, boundaries and time. Though scrappy tees & jeans have evolved popular today yet nothing can touch the majestic presence & aristocracy highlighted by suits. Yeah, it “suits” you “man”! Given the suave aura usual with suits, it’s not uncommon to find the outfit with high price tags. In fact, there are some real impeccable suits today that can reach up to almost a million. 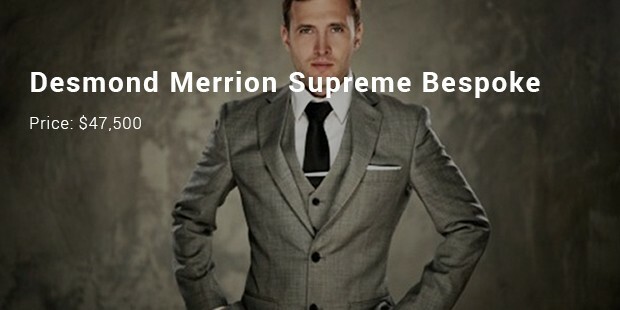 The post here offers a brief on some of the most expensive suits of the world. Famous luxury fashion designer Stuart Hughes paired up with Richard Jewels, the legendary tailor master, to come up with this extravagant artistic specimen. It took nearly 900 hours to complete these suits made of silk, wool & cashmere. 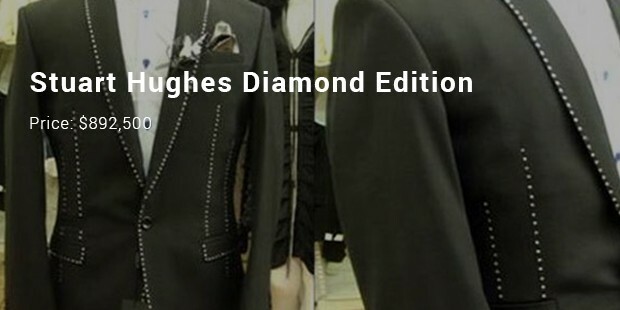 Moreover, the jacket is studded with 480+ half-carat diamonds. This majestic suite is made from 2 expensive-most wools: qivuik & rare vicuna. Interestingly, this grand piece was customized for some anonymous buyer. Each of the suits has 9 buttons studded with 18 K gold & diamonds. The suit was even delivered in armored van! 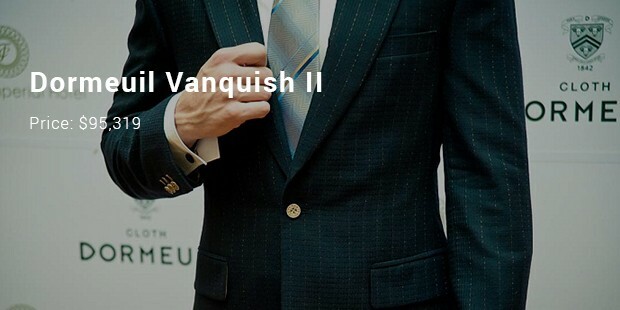 The Dormeuil brand has always been a legendary name given its luxury infusion of best British & French clothing that result in ultimate plush tailored suits for who’s who. This suit is made up of 6 rarest fabrics of the world: Fifteen Point Eight, Kirgzy White, Dorsilk, Ambassador and Royal Qivuik. This off-putting striped zoot-suit from 2nd World War era was sold at a whooping price of $78,000 at Augusta Auctions of NY City. 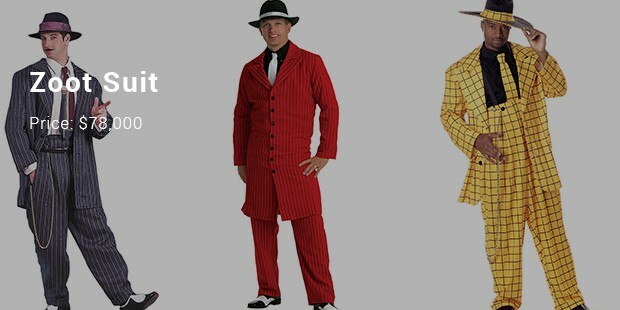 The reason behind such a hefty sale is not known and the owner of Augusta Auctions herself priced the zoot suit at around $600 to $900. 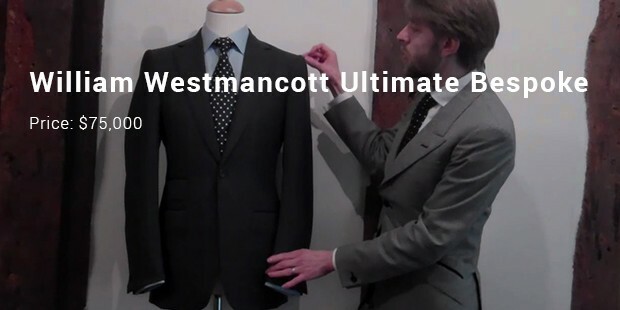 Instead of a 2 piece it has a 3 to 4 piece suit and it takes around 200 hours for a tailor to design this suit. A point to be mentioned is that the owner is a mere 28 years old. 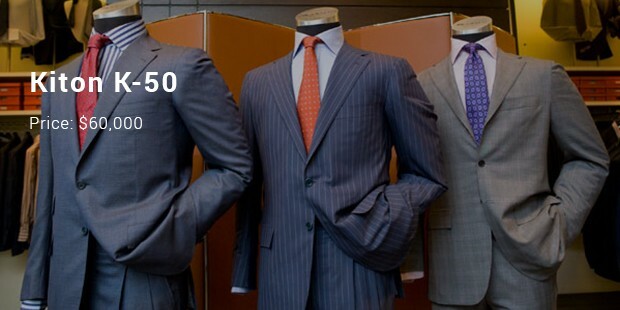 They have been in business since 1968 and is one of the most popular brands in men’s suits. In fact, they have close to 330 tailors who design around 330,000 suits per year. The material used for this suit is merino sheep wool. These are finely tailored suits and the handcraft of one of the most popular tailors in London known as Savile Row. One has to take into consideration that hand making is the cornerstone of tailoring, and it takes months to blend this suit. When the economy went bonkers in the year 2008, this Italian manufacturer reversed the trend by incorporating the most expensive suit ever. It goes on to use some of the rarest fibers in the world and the stitching done is of white gold. 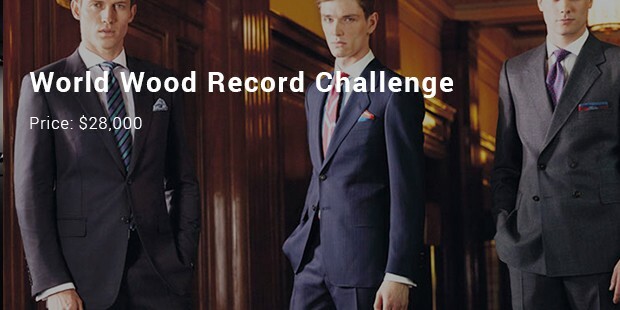 One might be wondering what the name World Wood Record challenge means? It is acompetition that has been created by LoroPiana and each year they call for the best designers to craft the best suits for men. Through a voting system, the winner is selected. Italians are known for their precise finishing and the best fabrics in the world. ErmenegildoZegna is one of the top fashion houses, and they had their inception more than 100 years ago. It is one of the finest producers of global fabrics worldwide. 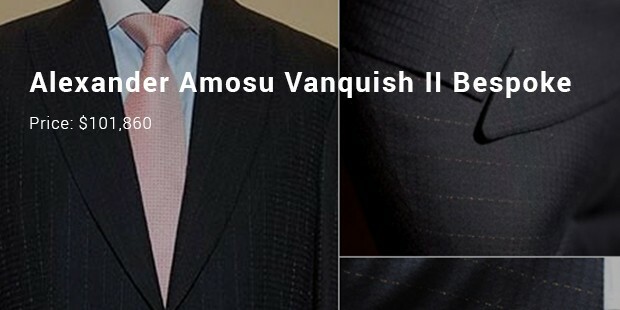 These suits are some of the finest specimens of exclusive design, infused with heightened sophistication and magnificence. It’s true that these are mostly meant for richie rich and the presence of richest & rare fabric accompanied by precious metals & stones, do justify the high tag.